A Ghostly Murder by Tonya Kappes, published by William Morrow and released in paperback on September 29th. This is the fourth book in the Ghostly Southern Mystery Cozy series. I read the previous book and was anxious for the next installment of this fun, lighthearted series. If you are looking for a good story to take your mind off your troubles, definitely pick a book from this series. Often I found myself laughing out loud. Mamie Sue Preston, one of the richest people in Sleepy Hollow is Emma Lee Raines' newest client. She hires Emma to solve her murder but more importantly to get her teeth back. You see Mamie is a ghost who only Emma can see since she is a Betweener meaning she helps ghosts solve their murders and cross over to the other side. Mamie was a hypochondriac and even on her tombstone it reads "I told you I was sick". 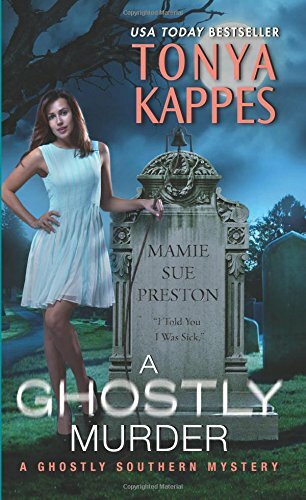 While Emma is investigating Mamie's life and death, she ends up with another ghostly client. What is so great in these books is since only Emma can see the ghosts, she ends up appearing to talk to herself often in public. This leads most to think she is crazy with a case of the "funeral trauma" as the Doc calls it. The writing is vivid and descriptive and I could just picture the town and it's inhabitants as I was reading. This series reminds me of Charlaine Harris and the Sookie Stackhouse novels. What I enjoy is each book has a different ghost or ghosts and can be read as a standalone. Tonya, the author, does an excellent job of giving readers enough information in each book. Sleepy Hollow has wonderfully believable characters and it is a pleasure to revisit them book after book. The town is filled with awesome places - The Higher Grounds Cafe, Eternal Slumber Funeral Home and Pose and Relax Yoga Studio. I look forward to going back to Sleepy Hollow to hear about the next ghost client Emma encounters. You can read an excerpt of one of the earlier books in this series here.